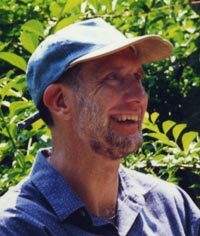 Many of you may know that John Oldham (whose namesake descendent is a member of Wethersfield's very own men’s garden club) was the leader of the “Ten Adventurers” who founded our central Connecticut town in 1634. But what none of you are aware of is the true story of why these brave explorers transplanted themselves from their homes in the Massachusetts Bay Colony to the unsettled land of "Quinnehtukqut". The Massachusetts Bay Colony (or MaBaCo) as its residents referred to it was settled by a bunch of English folks who sailed across the pond from Southampton to Plymouth in two waves – in 1623 on the Mayflower and 1630 on the Arbella. They all were Puritans (believers who wanted to “purify” the Church of England of its Catholic tendencies) – but the Mayflower travelers wanted to cleanse the church from within (”Non-Separatists”), while those on the Arbella (“Separatists”) wished to totally leave the C of E and strike out on their own. Much theological turmoil ensued. Or so we all were taught. But that was only part of the story. For traveling with each of these groups was a third faction of religious rebels who not only wished to sever all ties to the Church of England, but to establish a totally new religion based upon the horticultural teachings of God beginning with the book of Genesis. They were known in religious circles as “Garden-ists” – and John Oldham and his band of Adventurers were its leaders. The place within which they chose to sow their Garden of Eden was – you guessed it – a six-mile tract along the Quinnehtukqut River, which we now call Wethersfield. And, as clearly directed by their Lord, they chose as the object of their horticultural homage what came to be called the Wethersfield Red Onion. Minor setbacks occurred – such as the death in 1636 of Oldham resulting in the Pequot War, the annihilation of the tribe, and ultimately the appearance of a casino. Other members of the original Gentlemen’s Society also dropped off over the years but the organization continued to attract gathered new members – all the while staying off the Puritan radar screen. However, as often happens in such cults, as time went on the religious fervor of the new WTF-ers waned and more secular interest took over. Not coincidentally this change in emphasis occurred as the red onion became “The” major cash crop that drove the town’s economy. 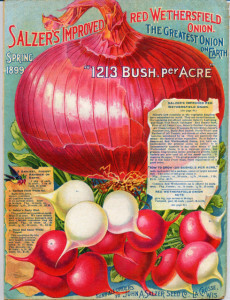 During the 17th, 18th and early 19th centuries one of the most important industries in Wethersfield was the cultivation of the Red Onion. Thousands of ropes of onions were shipped yearly down the Connecticut River to the West Indies where sugar plantation owners made it an important part of the diet of their enslaved workers as the onions are rich in vitamin C. Onions were traded for sugar, salt, tea, coffee, spices and molasses from which New Englanders made rum. Merchant ships that carried that cargo were built by local shipbuilders, often in partnership with residents of nearby towns. The prevalence of the Onion Maidens and the lack of religious fervor of its new members reduced the club’s sphere of influence. Then in May of 1781, word spread that General George Washington and French General Jean Baptiste Donatien de Vimeur, comte de Rochambeau were to meet again at Wethersfield to confirm the joining of their forces outside New York for a possible attack on the center of British power in America. And the Theological Farmers decided to welcome the generals with a red carpet of Wethersfield’s preeminent crop – because WTF! Unfortunately a light rain fell onto the onion-skin rug making it too slippery to negotiate. Washington went down first with Rochambeau falling on top of him. Fifty years later the combination of a blight known as pinkroot and the end of the plantation system in the West Indies in the 1830s signaled the end of the reign of the red onion. Tobacco and garlic supplanted the onion crop. Wethersfield transitioned to cultivating seed for the newly settled West. By that time, even though there were many Wethersfield Tobacco Farmers in the village, The Gentlemen’s Congregation for the Advancement of Floriculture in Wethersfield had deliberately faded from the collective memory of the town. And it was only by the sheerest luck that I came across the documents upon which this tale is based – many of which may actually be historically accurate.